C1q nephropathy is defined as the presence of mesangial C1q staining either dominant or codominant with the absence of clinical or serological findings of systemic lupus erythematosus (SLE). It was first described by Jennette and Hipp in 1985. It has varied light microscopic features including minimal change nephropathy, focal segmental glomerulosclerosis (FSGS), and crescentic glomerulopathy. It may or may not present with nephrotic syndrome. Neurofibromatosis type 1 (NF-1) is the most common neurocutaneous disorder inherited in an autosomal dominant fashion due to a mutation in NF-1 gene. The NF-1 gene is located at chromosome 17q11.2 and encodes protein neurofibromin. Association of NF-1 with glomerulopathy is rare. To our knowledge, this is the first case report of C1q nephropathy described in association with NF-1. On admission, he was conscious, cooperative, and oriented to time, place, and person. He was afebrile; had a pulse rate of 82 beats/min, regular, normal volume; and had blood pressure of 126/82 mmHg with a respiratory rate of 18 breaths/min. There was the presence of facial puffiness and pitting pedal edema. On per abdomen examination, there was generalized abdominal distention with fullness of flanks, and on percussion, there was shifting dullness confirming the presence of ascites. His respiratory and cardiovascular examination was unremarkable. He had multiple purplish, well-circumscribed, and pedunculated skin lesions over face, chest, abdomen, and back. [Figure 1]b Also, on the trunk was presence of many café-au-lait spots of more than 1.5 cm in diameter. [Figure 1]a Ophthalmological examination revealed two Lisch nodules in iris in the left eye and three in the right eye. There was a history of similar skin lesions in patient's father and paternal grandfather although no history of renal disease was present. The diagnosis of NF-1 was made as per the National Institute of Health Criteria [Table 1]. His laboratory investigations showed hemoglobin 13.7 g/dl, white blood cell (WBC) 10,500/mm3 and platelets 3.61 lakhs, creatinine 0.98 mg/dl, urea 48 mg/dl, sodium 135.3 mEq/l, potassium, 4.81 mEq/l, calcium (Ca) 6.1 mg/dl with corrected Ca of 7.6 mg/dl, proteins 4.5 g/dl, albumin 2.1 g/dl, globulins 2.40 g/dl, total cholesterol 371 mg/dl, random blood glucose 87 mg/dl, serum antinuclear and antidouble-stranded DNA antibodies by ELISA were negative, C3 148 mg/dl (N 90–207 mg/dl), and C4 47.2 mg/dl (N 17.4–52.2 mg/dl). ELISA for HIV and hepatitis B and C was nonreactive. Urine routine and microscopic analysis revealed the presence of proteinuria 4+, red blood cell 40–50/HPF, WBC nil, and no cellular casts. Twenty-four-hour urinary proteins were 5.1 g.
Ultrasound abdomen examination revealed the presence of ascites with fused kidneys present on the right side with preserved corticomedullary differentiation. A percutaneous kidney biopsy was performed under ultrasound guidance. Kidney biopsy pathological findings revealed the presence of 12 glomeruli with two glomeruli showing segmental mesangial sclerosis along with occasional synechiae formation with normal capillary membrane thickness and unremarkable Bowman's capsule. There were mild interstitial mononuclear cellular infiltration and mild tubular degeneration. [Figure 2]a and [Figure 2]b Immunofluorescence examination showed fine granular C1q (+3/+4) and IgG (+2) positivity across 70%–80% of the mesangial regions of all glomeruli with negative IgA, IgM, and C3. [Figure 2]c and [Figure 2]d Therefore, a diagnosis of C1q nephropathy was made. The patient was started on treatment with prednisolone 1 mg/kg/day (50 mg) and telmisartan 20 mg once a day. Patient achieved complete remission after 14 weeks of steroid therapy with complete resolution of facial and pedal edema with 24 h urinary protein reduced to 280 mg and hence steroid dose was subsequently tapered. After 5 months of treatment, the patient is still in complete remission and at present is on 20 mg of prednisolone. NF-1 is the most common neurocutaneous disorder with an autosomal dominant inheritance with an incidence of 1 in 3500 live births. It has varied clinical presentations including neurofibromas, café-au lait spots, axillary or inguinal freckling, Lisch nodules, and characteristic bony lesions (pseudarthrosis and sphenoid wing hypoplasia). Our patient had the presence of cutaneous neurofibromas, more than 6 café-u lait spots more than 1.5 cm in diameter, Lisch nodules in iris, axillary freckling, and positive family history of similar skin lesions. Therefore, diagnosis of NF-1 was made as per the National Institute of Health criteria [Table 1]. NF-1 is caused by mutations in gene encoding neurofibromin located at chromosome 17q11.2. NF-1 can involve the kidneys with the most common presentation being renal artery stenosis., Glomerulopathy is rare in NF-1 with only a few cases reported. Membranous glomerulopathy is the most common glomerulopathy reported in association with NF-1. The others include FSGS, IgA nephropathy, and MCN.,,,,, Our patient had presented with nephrotic syndrome and renal biopsy on light microcopy was suggestive of FSGS. IF microscopy showed the presence of fine granular (+3/+4) fluorescence across 70%–80% of the mesangial regions of all glomeruli on staining with anti-human C1q and (+2) with IgG antisera. C1q nephropathy has heterogeneous light microscopic features. Vizjak et al. studied 82 kidney biopsies from 28 children and 54 adults. 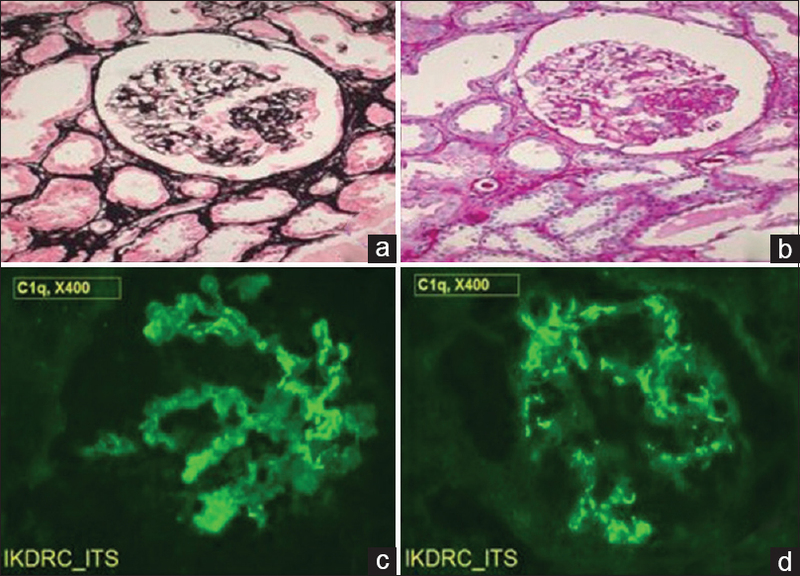 IF microscopy showed dominant or codominant staining for C1q in the mesangium, Light microscopy revealed no lesions (n = 27), focal segmental glomerulosclerosis (FSGS; n = 11), proliferative glomerulonephritis (n = 20), or various other lesions (n = 14). All patients with FSGS presented with nephrotic syndrome. Our patient had also presented with nephrotic syndrome and had FSGS on LM. The treatment of C1q nephropathy depends on underlying light microscopic lesion. The mainstay of treatment is glucocorticoids. Cyclophosphamide, cyclosporine, tacrolimus, or mycophenolate mofetil have been used in patients unresponsive to steroids. Minimal change disease has a more favorable response to therapy as compared to FSGS. Vizjak et al. followed up 53 patients with C1q nephropathy; 76.9% of the minimal change-like group but only one-third (33.3%) of the FSGS group were in complete remission after 4 months to 21 years, and four patients had partial remission after 4 months to 3 years. There were no clinical features of SLE, and serological markers for lupus were absent in our patient (ANA and anti-dsDNA). Hence, the diagnosis of C1q nephropathy was made, and in view of nephrotic syndrome, patient was started on prednisolone 1 mg/kg, to which patient responded well and achieved complete remission in 14 weeks. The activation of mitogen-activated protein kinase and mammalian target of rapamycin signaling pathways due to deficient neurofibromin as a mechanism for the development of FSGS and nephrotic range proteinuria in NF1 were proposed by Farsad et al. NF-1 has been rarely associated with various glomerular diseases. To our knowledge, this is the first case of C1q nephropathy in association with NF-1, but their independent occurrence could not be determined. The author acknowledges our chief librarian Ms. J Suthar for literature search. Authors are also thankful to the junior resident doctors for their help. Jennette JC, Hipp CG. C1q nephropathy: A distinct pathologic entity usually causing nephrotic syndrome. Am J Kidney Dis 1985;6:103-10. Malleshappa P, Vankalakunti M. Diverse clinical and histology presentation in C1q nephropathy. Nephrourol Mon 2013;5:787-91. Trovó-Marqui AB, Tajara EH. Neurofibromin: A general outlook. Clin Genet 2006;70:1-3. Tonsgard JH. 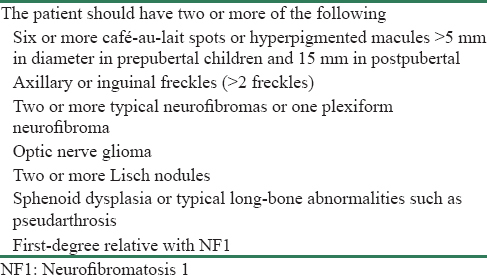 Clinical manifestations and management of neurofibromatosis type 1. Semin Pediatr Neurol 2006;13:2-7. Boyd KP, Korf BR, Theos A. Neurofibromatosis type 1. J Am Acad Dermatol 2009;61:1-4. Khan GA, Melman A, Bank N. Renal involvement in neurocutaneous syndromes. J Am Soc Nephrol 1995;5:1411-7. Malav IC, Kothari SS. Renal artery stenosis due to neurofibromatosis. Ann Pediatr Cardiol 2009;2:167-9. Tóth T, Trinn C, Simon L, Nagy J. A case of membranous glomerulonephritis associated with Recklinghausen's neurofibromatosis. Clin Nephrol 1996;45:271-2. Tarrass F. Focal and segmental glomerulosclerosis and von Recklinghausen's neurofibromatosis: Coincidental or associated? Saudi J Kidney Dis Transpl 2008;19:453-4. Gersch MS, Talor Z. Focal segmental glomerular sclerosis in a patient with neurofibromatosis type I. Am J Kidney Dis 2006;47:e17-9. Taniguchi Y, Yorioka N, Kanbe M, Okushin S, Oda H, Nishida Y, et al. Parent and child cases of IgA nephropathy associated with von Recklinghausen's disease. Nephron 1997;75:113-4. Wani MM, Reshi AR, Banday KA, Najar MS. Von Recklinghausen's neurofibromatosis associated with membranous glomerulonephritis. Saudi Med J 2006;27:534-5. Markowitz GS, Schwimmer JA, Stokes MB, Nasr S, Seigle RL, Valeri AM, et al. C1q nephropathy: A variant of focal segmental glomerulosclerosis. Kidney Int 2003;64:1232-40. Cheng MM, Chang ST, Jiang MY, Liu TH, Wu CC. Minimal change disease in a patient with neurofibromatosis type I. Acta Nephrol 2012;26:32-234. Vizjak A, Ferluga D, Rozic M, Hvala A, Lindic J, Levart TK, et al. Pathology, clinical presentations, and outcomes of C1q nephropathy. J Am Soc Nephrol 2008;19:2237-44. Farsad Afshinnia, Virginia Vega-Warner, and Paul Killen. Focal segmental glomerulosclerosis in association with neurofibromatosis type 1: A case report and proposed molecular pathways. Clin Kidney J. 2013;6: 208-10.